Following Contemporary Drug Synthesis and The Art of Drug Synthesis (Wiley, 2004 and 2007), two well-received works, is this new book that demystifies the process of modern drug discovery for practitioners and students. An enhanced introduction covers areas such as background, pharmacology, SAR, PK/PD, efficacy, and safety. 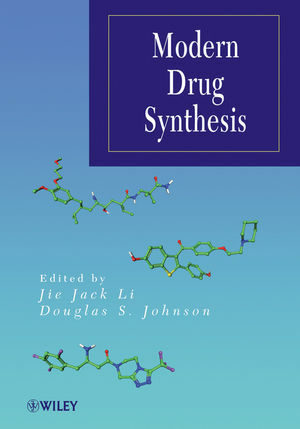 Focusing on the advantages of process synthesis versus the discovery synthetic route, Modern Drug Synthesis features authoritative coverage by distinguished editors and authors (some chapter authors are the actual inventor of the drug) of twenty different drug molecules. JIE JACK LI is a chemist at Bristol-Myers Squibb Company in Wallingford, Connecticut. He is the coauthor of various books, including Palladium in Heterocyclic Chemistry, Name Reactions: A Collection of Detailed Reaction Mechanisms and Synthetic Applications, Name Reactions in Heterocyclic Chemistry, Contemporary Drug Synthesis, The Art of Drug Synthesis, Name Reactions for Functional Group Transformations, Name Reactions for Homologations, Parts 1 and 2, and Name Reactions for Carbocyclic Ring Formations. DOUGLAS JOHNSON is a medicinal chemist and project leader at Pfizer in Groton, Connecticut. He is a coauthor on more than forty publications and patents, including the books The Art of Drug Synthesis and Contemporary Drug Synthesis.